Both diagnostic peritoneal lavage (DPL) and ultrasonic abdominal evaluation are good screening tests for the presence of hemoperitoneum after blunt trauma. Both examinations are similar in that they identify the presence or absence of blood in the abdomen but can make no determination as to the etiology of the hemoperitoneum. DPL is rapid, safe, and inexpensive. There is approximately a 1 percent incidence of major complication. DPL can be performed using either an open or a closed technique (Fig. 252-3. and Fig 2.5.2.-4). We generally prefer closed percutaneous DPL because the complication rate is no different from the longer, more cumbersome open technique. 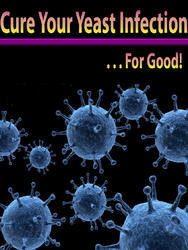 A positive tap is defined as the aspiration of 10 cc of free-flowing blood. If the tap is negative, 1 L of saline is instilled into the abdomen and the abdomen is drained by gravity. It is not clear how much return is necessary to have the test be reliable. Some authors recommend that 250 cc of return is necessary.5 One hundred thousand red blood cells per cubic centimeter is considered a positive lavage in blunt trauma. Thus only 25 cc of blood must accumulate in the abdomen (assuming complete mixing) for DPL to be positive. FIG. 252-3. Closed diagnostic peritoneal lavage (DPL). Closed percutaneous DPL is an effective manner of evaluating the abdomen for hemoperitoneum. A needle is inserted two finger breaths below the umbilicus after infiltration with local lidocaine with epinephrine. 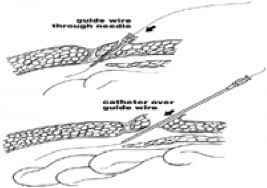 A guide wire can be then inserted into the abdomen and the peritoneal lavage catheter inserted over the guide wire. One liter of fluid is instilled and the abdomen is then drained. FIG. 252-4. Open diagnostic peritoneal lavage. Open diagnostic peritoneal lavage is a surgical procedure requiring some expertise. An incision is made under local anesthetic and can be performed in an infraumbilical or supraumbilical location. Patients with pelvic fractures must have their DPL performed open and above the umbilicus. An incision is made through the skin and subcutaneous tissue under local anesthesia. The fascia is opened and a purse-string suture placed in the peritoneum. 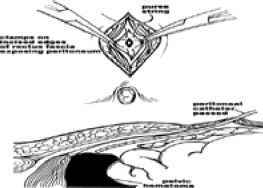 The peritoneum is then opened within the purse-string suture and the catheter passed into the peritoneal cavity. 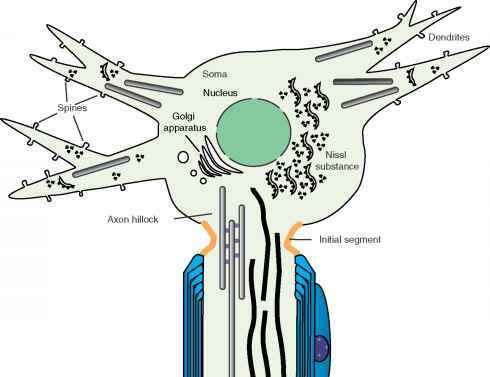 Fluid is infused and returned as with a closed DPL. Laparotomy based solely on a positive DPL for red blood cells results in a nontherapeutic procedure approximately 30 percent of the time. 6 Minimal injury to the liver or spleen or trivial mesenteric injuries can easily produce a hemoperitoneum sufficient to render DPL positive. Five hundred white cells per cubic centimeter had been suggested as another limit for positivity. More recently, white cell count DPL effluent has been criticized as being nonspecific. 7 We have abandoned the use of white cells as criteria for positive DPL. In addition, biochemical assays such as liver function tests or amylase determination are occasionally done in DPL effluent. None of these is an effective screen for intraabdominal or retroperitoneal injury. Decision on laparotomy should be made based on the patient's hemodynamic stability and associated injuries in concert with the results of the DPL. A patient with a positive DPL who is stable and does not exhibit signs of peritonitis is a candidate for nonoperative management. Focused assessment with sonography for trauma (FAST) is a rapidly evolving technique to screen for intraabdominal injury. Like DPL, it can determine the presence or absence of hemoperitoneum. FAST is clearly operator-dependent, and considerable expertise is necessary to use FAST safely as a screening test for abdominal injury. FAST is extremely rapid and can be performed in under 1 minute by a skilled operator. Like DPL, FAST is nonspecific and is ineffective for imaging the retroperitoneum. The number of cubic centimeters of intraabdominal fluid necessary for a positive FAST remains a subject of interest. Clearly, more skilled operators will be able to detect smaller amounts of fluid. Many people believe that several hundred cubic centimeters are necessary to be clearly visible using ultrasound. 8 Like DPL, FAST cannot determine the etiology of the fluid. FAST is generally performed in four areas: perisplenic, perihepatic, pelvic, and pericardial, the so-called four P's. No matter which organ is injured, the perihepatic view is most commonly positive. Blood pools in Morison's pouch, the most dependent portion of the abdomen. FAST offers a view of the pericardium that can be extremely helpful. Pericardial tamponade is rare in patients with blunt injury. The utility of FAST to determine the need for laparotomy is at best questionable. Several authors have described scoring systems for FAST. McKinney and colleagues have encouraging data that suggest that their scoring system is accurate in determining the need for laparotomy. 9 Unlike DPL, FAST can be done easily in a serial fashion. Clearly, FAST has limitations. Its ability to detect small amounts of fluid is questionable even in very skilled hands. Thus a small bowel injury with a small amount of fluid may not be detected by the initial FAST. In addition, there are no data that suggest that a single FAST is capable of absolutely excluding intraabdominal injury. While the data on this are somewhat sketchy, a recent international consensus conference on the use of ultrasound for trauma concluded that prudent evaluation would involve a minimum of two ultrasound examinations performed at least 6 h apart.10 This would need to be supplemented with serial physical examinations and laboratory evaluations to avoid missing an intraabdominal injury.